Unlike a dog or a cat, spiders in general, do not like to be handled. They do not care about being caressed with your fingers nor will they reciprocate affectionate feelings. So in general, it is best to avoid handling your tarantula. However, during maintenance and cleaning, you may have to handle a tarantula. Like dogs and cats, some tarantulas are easy to handle and some not so. Overall, most tarantulas like to be left alone. A tarantula does not necessarily need to be handled during maintenance. In most cases, it will hide until you are done. The first thing you have to know is that inside its enclosure the tarantula appears sluggish and lethargic- but make no mistake, given the opportunity it can quickly jump and get away. After all, no one wants to be kept in a small box for its entire life. If you have to pick the tarantula then the best way is to gently allow it into the palm of your hand. Some gentle nudging with a soft brush may work but do not use your finger. Some experts recommend gently picking up the tarantula by its legs, but you also have to be gentle and fast. Once the spider is in your palm, it may move around so you have to watch it and may have to alternate hands to prevent it from falling. Do not place the tarantula on your shoulder or your chest because if the tarantula falls from a height, it can get hurt or even die. Even though the tarantula has strong legs, it has a very weak abdomen that can burst open during the fall. What if the tarantula does not want to be picked up? Most tarantulas hate being picked up and will retreat. Sometimes it may make its throw it hairs at you just like a porcupine throws its quills. These hairs can cause a very irritating itch and can be painful. If you are very rough with the tarantula, it may even bite you but the amount of venom is so small that it will have no effect on an adult. However, you will feel the sting, which is similar to a bee sting. If you do get bitten, stop what you are doing and clean the skin under running water for 5 minutes. You may apply an antiseptic to prevent any infection. The bite will hurt for several hours. If you develop an allergic reaction like a rash, chest pain, swelling of your lips and face, you need to seek immediate medical attention. Fortunately, in the majority of cases, a tarantula will send you a warning before biting. It will stand erect on its hind legs and show you its fangs—akin to a dog. If after this sign you persist, then you will get bitten. So if you note signs of fear in your spider just leave it alone. In most cases, pet tarantulas settle down with time and rarely bite. Once they get used to you hand, it is very rare for a tarantula to show any aggression. Getting your pet tarantula used to your hand takes time. In the beginning, do not be in a rush to hold the tarantula but let it get used to your hand and smell. Once it gets used to your hand and you start to learn behavior signs of aggression, you will know the right time to pick the arachnid up. Finally, a practical point; ‘do you like to be handled by your feet or be picked up when you are sleeping?’ If the answer is no, then the same applies to your pet tarantula. The least handling you do, the better it is for the spider. 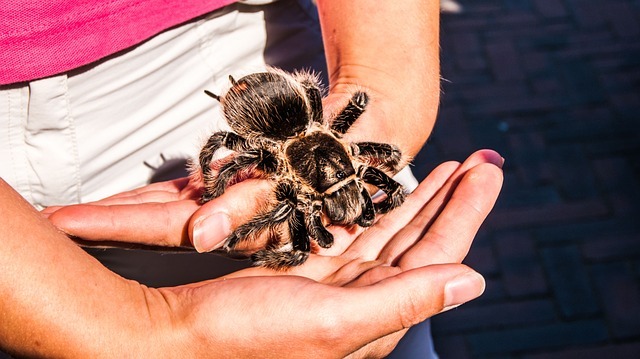 While this may not be ego boosting like many zookeepers who pick up these creatures, it will help maintain your tarantula healthy and prevent any unnecessary injury. Tarantula Friendly © 2019. All Rights Reserved.